In last six days, petrol price in Delhi has come down by 47 paise from its record high of Rs 78.43 on May 29. Before reducing the prices, oil marketing companies had hiked the fuel cost for 16 consecutive days - from May 13 to May 29, petrol price was raised by Rs 3.8 and diesel by Rs 3.38 per litre. Petrol prices today were slashed by 15 paise in all metro cities - Delhi, Kolkata, Mumbai, and Chennai. This is the sixth straight cut in fuel prices in just a week. Today's petrol price in Delhi is Rs 77.96, in Kolkata Rs 80.60, in Mumbai Rs 85.77, and in Chennai Rs 80.94. 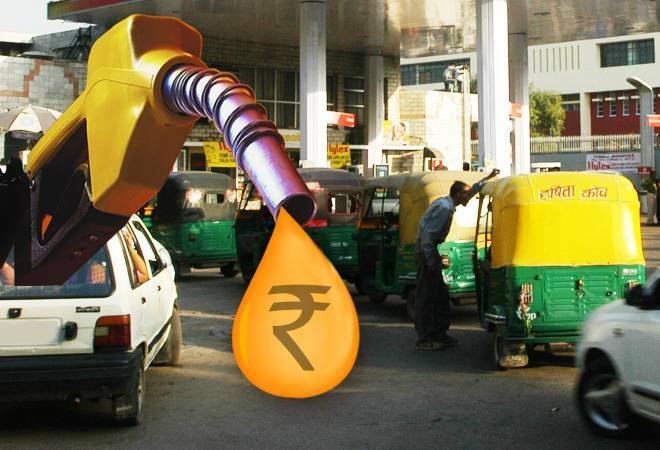 Diesel price has also seen a marginal cut of 14 paise to Rs 68.97 in the national capital. Yesterday, petrol price was down by 9 paise. However, diesel price was kept unchanged. Sudden hike in petrol and diesel prices was a result of uptick recorded in international crude oil. Indian fuel prices are directly linked to international crude oil that had gone up due to multiple global factors- fear of new US sanction on Iran and short supply. But, here in India the pressure began to mount on the government for not being able to come up with some formula to contain the prices. The opposition parties are calling for tax - excise and VAT - cut and inclusion of petroleum products under the GST. The Centre does not want to do that for fear of slipping on fiscal deficit target. The Central government levies Rs 19.48 excise duty on a litre of petrol and one rupee cut will result in Rs 13,000 crore loss for the exchequer annually. Last week, Economic Affairs Secretary Subhash Chandra Garg said that the reduction of the excise duty levied on transportation fuel will have corresponding effect on fiscal numbers. Another option that the government has is to bring the fuel under the GST. But, only few states have taken stand on this options as they fear revenue loss. Their fear could be justified as the maximum tax slab under the new taxation system is Rs 28, whereas the current tax on fuel is somewhere close to 50 per cent. But, even bringing petrol under GST may not reduce the fuel price. Recently, Bihar Deputy Chief Minister Sushil Kumar Modi said that 'it is a big misconception (among the people) that price of petroleum products will be reduced significantly if they are brought under GST ambit'. He said that under the GST regime, there is a practice across the world which empowers states to impose tax over and above the highest GST tax rate. Even if fuels are brought under new taxation system, the states can still impose taxes to compensate their loss, he suggested. According to reports, the government is mulling to introduce a windfall tax on oil producers like ONGC as part of a permanent solution. It may ask ONGC to give subsidy to fuel retailers so that they can sell petrol and diesel at below market rates. Union Minister Prakash Javadekar on Saturday said that the central government was working to find a long-term solution to curb the spiralling fuel prices. He also urged the states to come together to help the consumers as they also levy VAT - a request that seems unlikely.